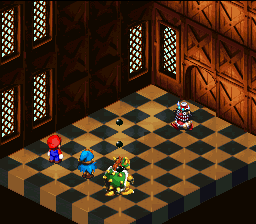 Spritz Bomb is an attack from Super Mario RPG: Legend of the Seven Stars used by Axem Black, Manager, Director, Booster and Shy Rangers in battle. When used, a barrage of bombs will appear over a character and proceed to drop on top of them and explode, injuring them. This page was last edited on May 22, 2017, at 04:46.